Ok.. I’m deferring my blog a little from the usual recipes, cakey talk and day trips and today writing about shoddy cakes! Eek! Dare I? Yes, I dare! Why? Because I am passionate about what I do, I hate the cake designers (if that’s what you can call them) out there that think this is an easy job to do and just send any old cake out. I know hate is a strong word, but it’s really how I feel about it. It actually really doesn’t matter what your skill level is, just so long as you are realistic in your business! As a customer would you settle for bad service anywhere else? Would you be happy if you got burnt food in a restaurant, your car mechanic did a below standard job and overcharged you, or even if you ordered a fancy new frock and it turned up completely different to what you imagined? I doubt it, you would complain, you would expect your money back right? If you pay for a professional service, you should receive a professional product. So, my point is this: Please check out all the galleries of your chosen baker before ordering from them. Even compare their work to other bakers in your area. If they are cheaper than all your other quotes is there a reason for that? Of course there could be a genuine reason, such as they are new and building their portfolio, but there also could be some other hidden (or not so hidden) reason. Cheap ingredients? Battery farmed eggs? margarine instead of butter? Shoddy decorating? Remember, bespoke cakes are not cheap, they are special treat & a lot of love, care and attention should have gone into your order. This is your special occasion you are ordering for, and you should receive exactly what you had envisaged. Now, don’t get me wrong, I don’t think I am the most amazing baker/decorator out there. I still have lots to learn, but I am pretty confident that I don’t ever send shoddy cakes out! I take care over the tiny details, I make sure there are no lumps and bumps where there shouldn’t be. I finish my cakes with lovely ribbons, I cover my cake boards, I deliver them in secure boxes. I add small touches that I know are personal to my customer. Most importantly, I don’t ever take on an order that is out of my league! So, here are a few examples of what I mean: I have of course credited the amazing baker who did a great job, but not the bad as that would be unfair and not the aim of this blog post. 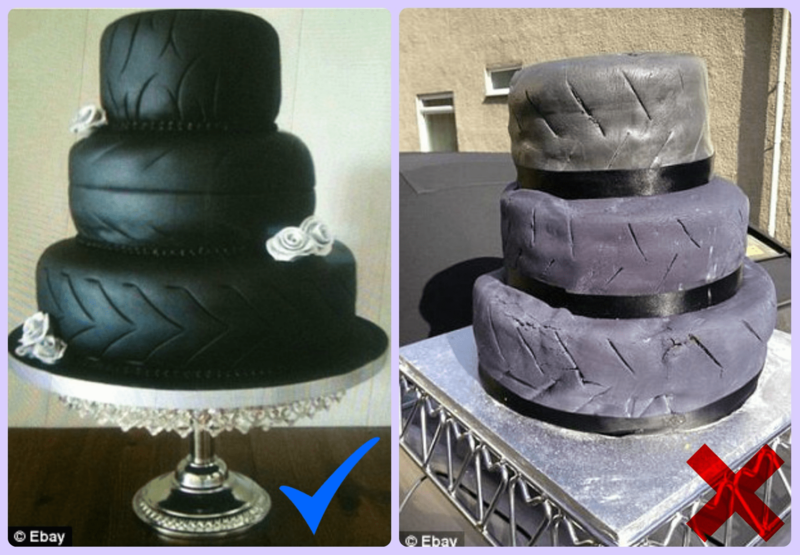 Another example is the tyre wedding cake! I’m pretty sure that most people saw this as it went viral online. But, if you didn’t the story goes that an unsuspecting bride ordered this wedding cake on the left, a slightly unconventional design to say the least, but still, it was what she wanted for her big day, and it was personal to her and her husband-to-be. Can you believe what she received? Not only is it wonky, its just a monstrosity right? Tyre wedding cake – I can’t credit the original baker of the cake on the left as their are so many images online its hard to find who actually did this cake. Is your baker registered with the local authority/Food Standards Agency? Have you checked through their galleries of work? Don’t think that just because they are maybe a little better than what you can do they are acceptable, you should be wowed by their work! Don’t be afraid to ask your baker questions about their ingredients, and what they use. It’s your cake, you are entitled to know everything about it. Finally, I thought I would add a few images of my cakes. These are orders that once received I researched how to do each design, practiced each technique, but most importantly they are cakes I put my heart and soul in to and loved as much as the recipients themselves. I made sure they were straight, my icing was smoothed to perfection, each ruffle was hand painted, and finally finished off with ribbons and prettiness.